Yeah I also was thinking it would be a problem. The "combo" part of the deck take too much place imo. 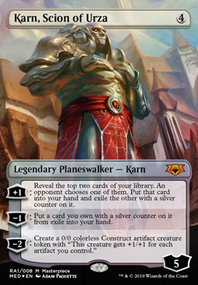 I was planning to either try a GR version, with lots of creature and Kraul Harpooner as a finisher with a PUNCH. It would allow the deck to win without the combo and the other creatures would be big enough to justify the punch by them. But if I were to keep the GBR version, I would drop Golgari Raiders, Moodmark Painter and maybe Molderhulk. 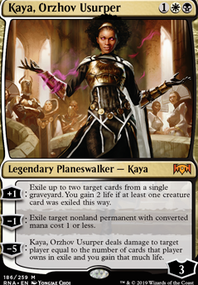 Instead, I would try to get either threat that don't depend on the graveyard : Doom Whisperer ( + the surveil allow us to fill the graveyard like crazy ) or better ones : Charnel Troll. Tormenting Voice instead of Costly Plunder, it also makes us drop another creature in the graveyard maybe. Assassin's Trophy instead of Find / Finality. Gruesome Menagerie for the super value ( sticher, shaman and jadelight ? ). I am trying to cut a lots of the combo because the opponent can easily disrupt it, so there have to be another way to win. The GR version will prolly be more consistent about the winning but will not depend on the PUNCH as much as the GBR. This one could go crazy with it tho. Sticher into Shaman into Jadelight into Kraul+Thud ? Could get a 8 or 9 in the op face at turn 4 ! Those are my thought for now, I hope it will help you ! Your deck doesn't seem to run enough instants and flash cards to play Sinister Sabotage well. I would also cut Unexplained Disappearance for slots. -Etrata, the Silencer as it doesn't help with the gameplan of this deck. Etrata does better in a dedicated Helm of the Host deck. I also don't see too many good targets for Quasiduplicate here. Most of your stuff doesn't even have strong enter the battlefield triggers to copy. I'd say put in a 4th Dimir Spybug and a 4th Nightveil Sprite for consistency. Additional Disinformation Campaigns also work pretty well with Nightveil Sprite, as forcing the enemy to discard two cards early on can stunt their gameplan. multimedia on Could you call a neckbeard "undergrowth"? Hey, nice prerelease sealed deck, but a deck like this doesn't translate well to Standard. This is fine list of cards you want to play in Standard, but it's not yet a finished deck. Starting out making a list of cards is good, everyone starts out doing this, but the next step is to narrow down the list. Keep the good cards and cut the rest. For Standard decks don't build them like sealed decks. You can use up to four copies of a card in a Standard deck and you have freedom to play the better cards and cut the least good cards. 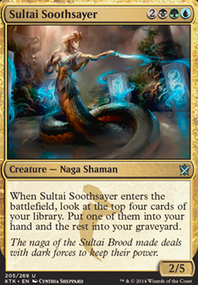 For example here cards like Glowspore Shaman, Kraul Harpooner, Golgari Findbroker, Underrealm Lich, Izoni, Thousand-Eyed, Find / Finality, Status / Statue even Swarm Guildmage are all good cards for Standard. Why are they good cards for Standard? They either give you value when ETB (enters the battlefield) (Glowspore, Findbroker). Have good stats (power and toughness) for their mana cost (Hapooner, Glowspore). They can win you the game if not answered right away (Lich, Izoni) or they give you a lot of options for a single card (Status, Find). 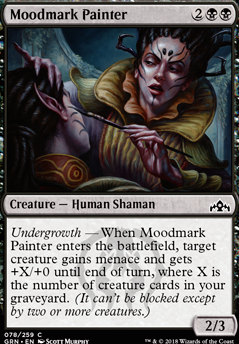 In contrast cards like Child of Night, Moodmark Painter, Hired Poisoner, Erstwhile Trooper, Grappling Sundew, Deadly Visit, etc. are not cards for Standard because there's many other cards that cost the same that are better options. I don't want to tell you how to make your deck. I'm simply giving you some advice of how to improve it for Standard. In Standard you can also play cards from other sets. In Guilds of Ravnica Standard which starts Oct. 5th you can also play cards from sets: Ixalan, Rivals of Ixalan, Core Set 2019 (M19) and Dominaria. Using cards from all these sets and cards from Guilds of Ravnica you can build a good budget casual Golgari Standard deck with only uncommon/common cards with a sprinkling of rares/mythics that you have. Here are three strong budget cards for Golgari: Dusk Legion Zealot, Plaguecrafter and Ravenous Chupacabra. I offer more advice such as good practices when building a Standard deck, etc. Would you like more advice? Stumbled on Necrotic Wound and Connive / Concoct as a combo...albeit probably clunky. Drop a larger creature to at least two with Necrotic Wound then steal it with Connive / Concoct. Probably not too viable, just thought it interesting. Going to test with Moodmark Painter the +X and menace might be helpful.